Is there a better alternative to Tick? Is Tick really the best app in Applications category? Will Tick work good on macOS 10.13.4? 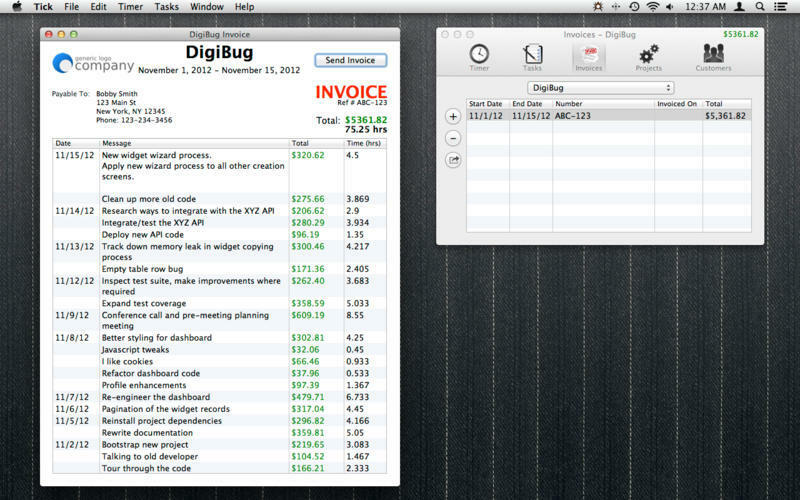 Tick is an easy-to-use billing application that quickly creates professional looking invoices. Whether you are a full time contractor, or working part-time on the side, Tick can help you track the hours spent on each project. Tick is designed to be intuitive and unobtrusive so you can focus on your work, not this app. Projects and Customers: Set up as many projects you want. For each project, assign a client and the hourly rate you'll be charging. 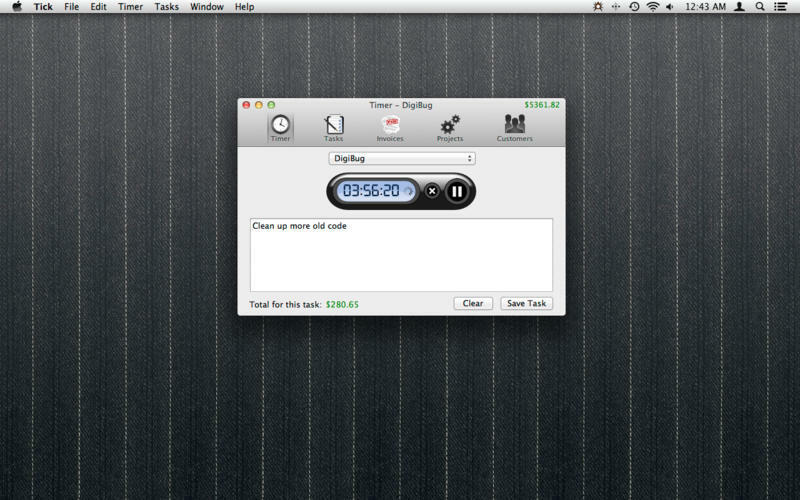 Timer Widget: Track the hours you spend on each task. Assign a project and a description of the task to save it. Tick needs a review. Be the first to review this app and get the discussion started! Tick needs a rating. Be the first to rate this app and get the discussion started! Timers can be controlled via keyboard shortcuts. 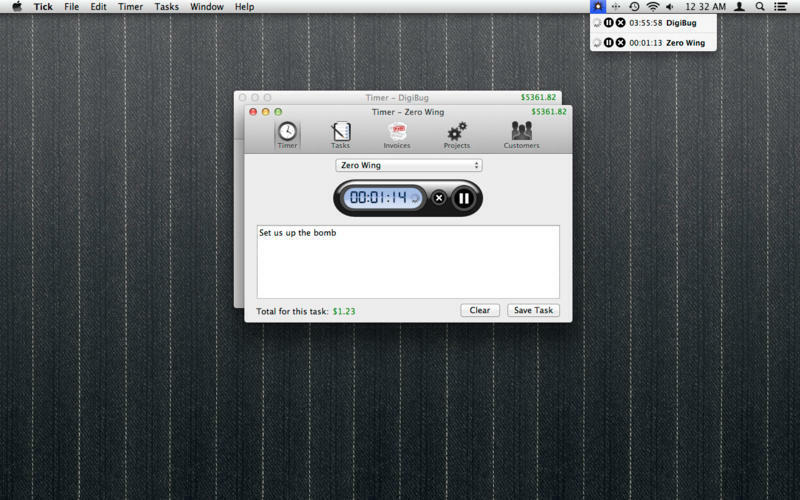 Timers can also be controlled from the menubar, reducing the need to toggle between windows. Multiple windows can be used simultaneously to track time on multiple projects. 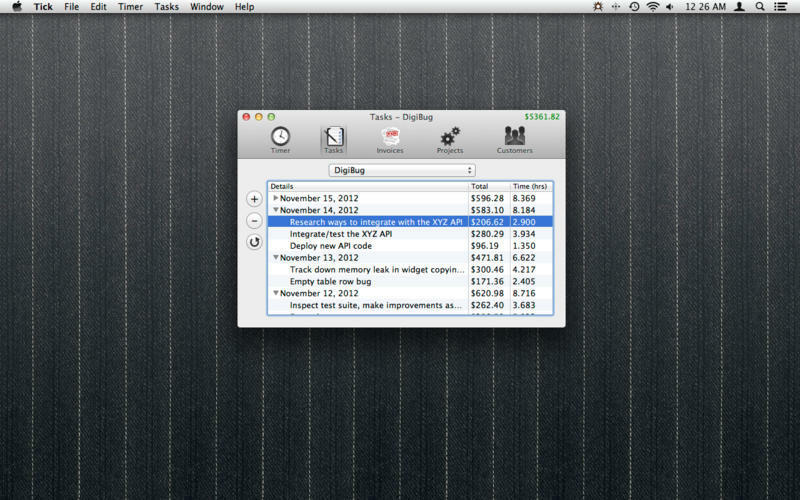 Tasks: For each project, a log is kept of which tasks are completed each day. This makes it easy to see the total hours spent and total money earned each day. Export the tasks for any of your projects into a tab-delimited CSV file. Easily back-date any existing tasks. Round time for tasks created from the Timer. Invoicing: When ready to bill for a particular project, Tick will group the tasks by date into a professional looking invoice. You can choose to have the PDF emailed to both you and the client, or saved to your filesystem. Drag and save a logo on the Invoicing preferences and it will show up in the PDF invoice. Privacy Mode, for when you don't want the people close by seeing all the money you're making. International currency support. Choose whether to bill in Dollars, Euros, Pounds, Yen, Yuan or Rupees. Don't see your currency? Visit the URL below and request it be added!